Egg roll machine is a machine for making egg roll with eggs, flour and other ingredients. One person can operate this machine. It has the characteristics of convenient cleaning, beautiful appearance, practicality, and sanitation. It is the ideal machine for investment in the market. The egg roll machine adopts computer programming and button control. 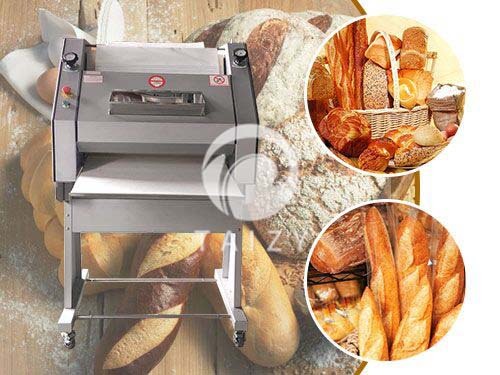 It is a snack food machine, cake making equipment, and bakery equipment. 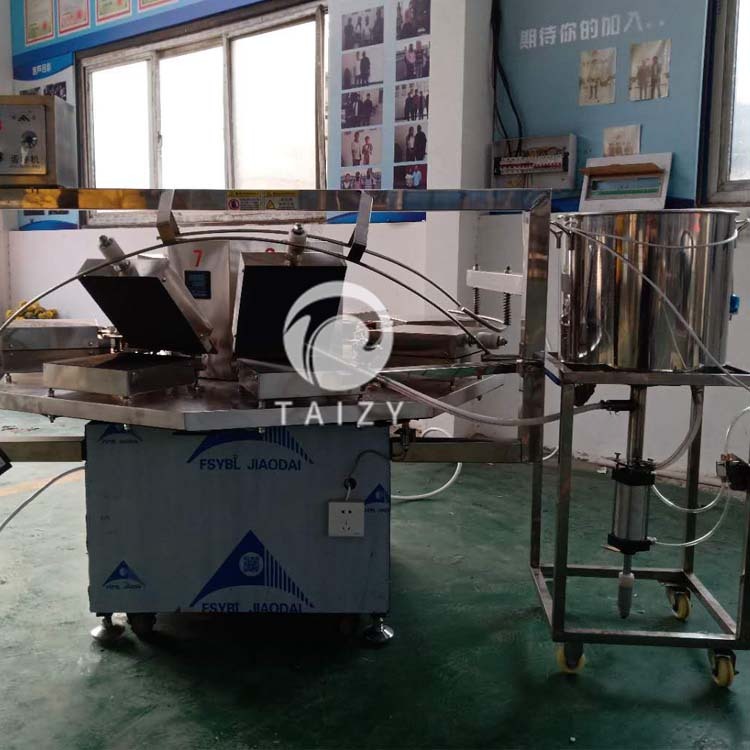 Automatic egg roll machine is made of thick stainless steel plate. The mold is made of a thick aluminum plate. 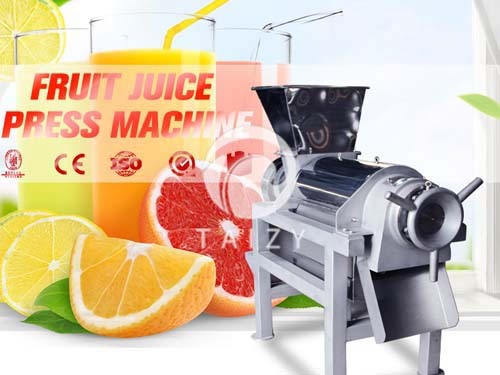 (Overcome the weakness of the iron egg roll machine that is not resistant to high temperatures and easy damage). Imported heating tube device with good heat resistance which maximizes the durability of the machine. The internal heating tube has a reasonable layout, the egg roll is evenly heated, and the color is bright. Adjust the temperature control device during installation. Temperature control ranges 160-175℃. During the production process, temperature control is more accurate, which guarantees the superior quality of the final product. It has the characteristics of good safety performance, high-temperature resistance, continuous production, and high efficiency. 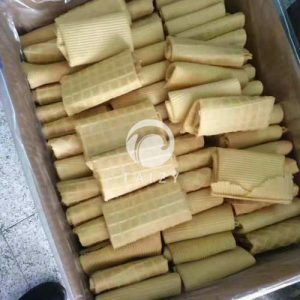 It is the ideal equipment for making high-quality egg rolls in the market. Power is turned on during production, warm up for 15 minutes, Wipe the upper and lower template with a small amount of cooking oil. Connect the slurry pump to make paste automatically, and take it out after one circle. 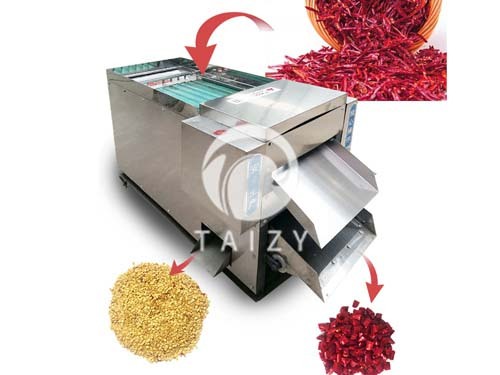 In addition, The egg roll machine is equipped with an automatic reeling machine, which is highly efficient. 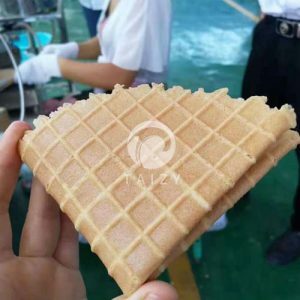 Egg roll machine adopts advanced heating method with high work efficiency. Small floor space, easy to learn. It can make brioches, chocolate omelets, and various sandwich rolls. The egg roll is light, beautiful and practical. 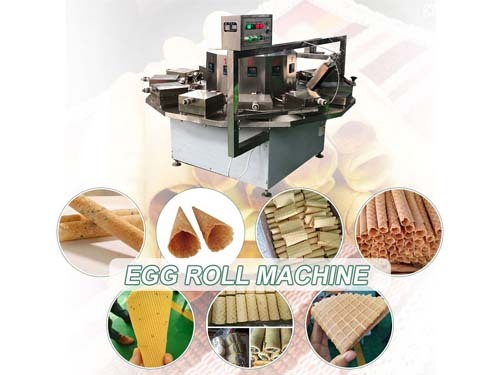 The egg roll machine is easy to operate and has a high degree of automation. The finished egg rolls have beautiful color and the flavor is crispy. The production process is clean and hygienic. 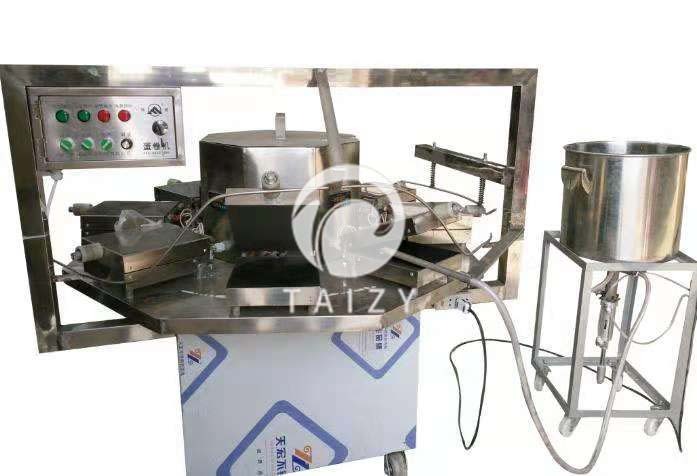 Automatic grouting: The mold automatically opens after the egg roll is mature. ( Equipped with automatic sensing device). The thermostat adopts digital display high temperature, temperature control is easy, and the egg roll color is uniform. Energy saving: the upper and lower plates has high-temperature resistance. The egg roll machine has good safety performance, high productivity, and high efficiency. 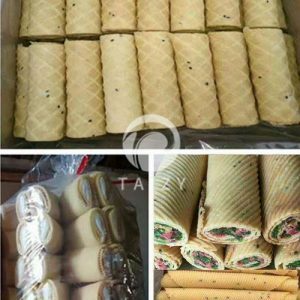 The size of the egg roll can be customized. The thickness of the egg rolls adjustable. 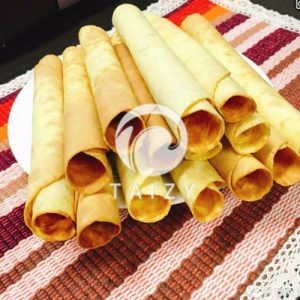 Can make different grains egg rolls. (such as stripes, squares, and so on). It can make various egg rolls. For example, corn / millet / black rice / sorghum / purple potato / red beans / sesame and banana rolls. With less oil and sugar, crispy in taste, suitable for all ages.